The short-lived Korean Empire (1897-1910), also known as the Daehan Empire, an interregnum between Joseon and Japanese colonial rule, is often seen as a dark period in Korean history when the 600-year-old kingdom struggled to remain independent amid the onslaught of foreign powers, especially Japan. “Art of Korean Empire: The Emergence of Modern Art,” running through Feb. 6 at the National Museum of Modern and Contemporary Art’s Deoksugung branch, looks at the period through art produced during the era. “The exhibition has been initiated to shed light on efforts made during the Korean Empire to preserve the tradition and legacies of Joseon and embrace the new,” curator Bae Won-jung said during a press conference Wednesday at the MMCA’s Deoksugung branch. The people did not just surrender to the influx of foreign cultural elements but adopted them to improve existing cultural traditions, she said. Presenting some 200 paintings, documents, craftworks and photos made between 1890 and 1920, the exhibition challenges the prevailing view that Japanese and Western art influences were accepted indiscriminately at the expense of the venerated artistic tradition of Joseon. “Cranes and Heavenly Peaches” -- a 7-meter-wide, 12-panel folding screen believed to have been made on the occasion of the 40th anniversary of Emperor Gojong’s ascension to the throne -- is an example of the ways in which artists of the Korean Empire responded to foreign art elements. The painting adhered to elements of traditional art, such as the use of cranes and peaches, both symbolizing longevity. At the same time, the painting made extensive use of bright colors and gold leaves, often found in traditional Japanese paintings. “Portrait of Emperor Gojong,” a photo taken in 1918 by Kim Kyu-jin, a court-commissioned photographer and painter, was bestowed by Emperor Gojong to railroad and shipping tycoon Edward Henry Harriman when he visited the Korean Empire in 1905. The absence of that particular folding screen is telling of the erosion of the traditional values of Joseon, stemming from the sudden influx of Western values. The change in the color of the royal robe could represent Emperor Gojong’s efforts to elevate the declining status of the sovereign. The images of Gojong are thought to have been allowed to be distributed outside of the court to make his presence known to the outside world. “During the Joseon period, only a single portrait of the king was allowed. Because people believed the spirits of kings dwelled in the painted portraits, they did not duplicate them. If a painting got worn out, they made a new one and burned the old one. This tradition started to change after the introduction of photography. During the Korean Empire, the emperor’s portrait was duplicated and distributed outside of the court, largely for political purposes,” said Bae. 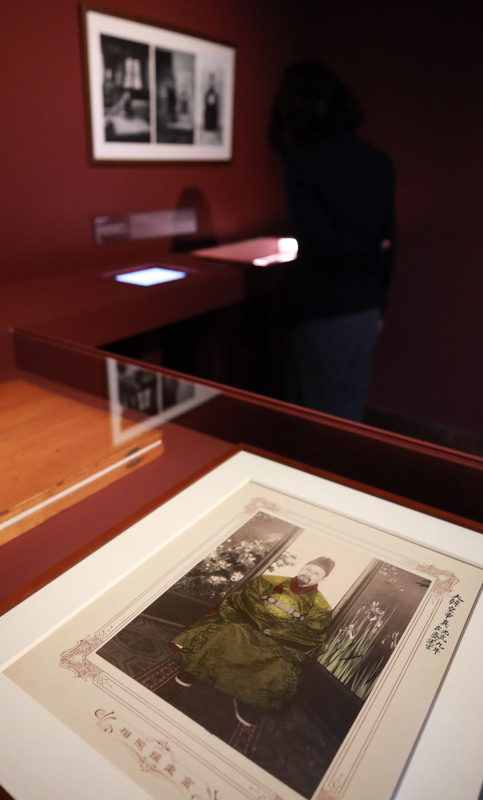 “Many have argued that the photos -- including those of Gojong and the royal family -- were used by Japan as a means to glorify their achievement -- the modernization of Joseon. However, it is also true that Gojong took the photos and distributed them to other countries to let others know of the nation,” Bae said. The exhibition also includes a section dedicated to craftworks of the Korean Empire featuring imported handicrafts used in the imperial court, as well as traditional craftworks that embraced Western aesthetics. A two-channel video work that shows perhaps the last court paintings produced during the Korean Empire concludes the exhibition. In 1917, the original buildings of Changdeokgung were destroyed in a fire. The buildings were restored later, and six artists -- including Kim Kyu-jin -- were asked to paint two paintings for each building. MMCA Deoksugung is closely tied to the history of the Korean Empire, having originally opened in 1938 as the Yi Royal Family Museum of Art. It is one of the two neoclassical buildings inside the royal palace. Seokjojeon Hall, completed in 1910, was used as the office of Emperor Gojong until his death in 1919. The building reopened in 2014 as the Daehan Empire History Museum after years of extensive restoration. The Cultural Heritage Administration is currently holding a special exhibition of royal clothing titled “Imperial Attire of Daehan Empire” through Dec. 12.